As long as I can remember, loganberry jelly has been my favourite. I could only have it in the summer and at Christmas time when we went to Vancouver Island to visit my grandparents. My family gawked as I spread extremely thick layers of loganberry jelly on my toast every morning. But I was in heaven, so they let me be. 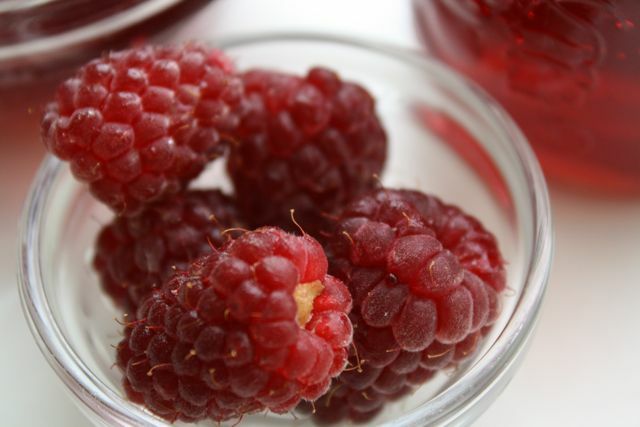 The loganberry is a cross between a raspberry and a blackberry. Apparently, my great-grandfather planted this loganberry. I’m guessing that would put it somewhere in the 1920s or 1930s. That loganberry is still growing, on the edge of my grandparents' old garden outside of Courtenay. I visit it when I go up to see my uncle and aunt and cousins who still live on that land. These days, it only produces a few berries, but I still get pretty excited about it. I know how to make my own loganberry jelly now, so I can have it year-round. 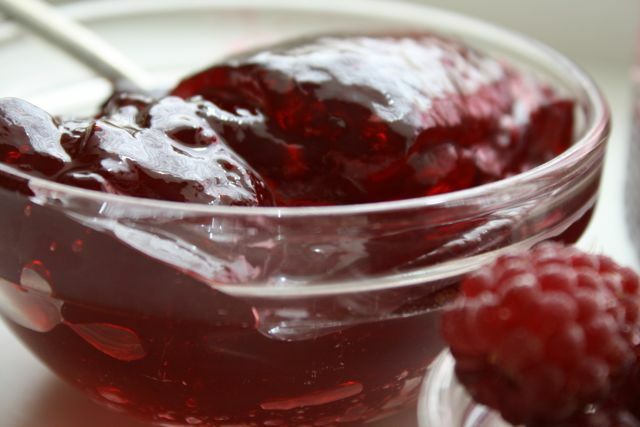 My great-aunt Marjorie, my grandma’s sister, learned this jelly recipe from her mother. Marjorie taught me how to make it a few years after my grandma passed away. This year, my husband and I picked berries and made jelly with our friends Catherine and Guthrie. We boiled and strained and listened to records and boiled some more . . .
By midnight, we had this gorgeous, ruby red jelly. It tastes as good as it looks. A note: This recipe looks inexact, but that’s only because you never know how much juice you have until you strain it. Once you strain it, the recipe becomes very exact. Read through the whole recipe first, and you'll have a sense of how much sugar and pectin you’ll need. Bring to a boil, stirring every so often. Simmer until the berries are mushy and their juice is coming out, about half an hour. While they are simmering, set up your straining station. Our family tradition goes like this: balance a broom handle across two chairs, which are back to back. Leave enough room for a giant bowl to sit on the floor in between the chairs. Cover the floor in between the chairs with newspaper to catch any splatters. Place the giant bowl on the newspaper. Above the giant bowl, use the cheesecloth to make a sling that is at least three layers of cheesecloth thick. Knot the cheesecloth onto the broom handle twice. The empty cheesecloth sling then sits suspended over the bowl, ready for your berry mixture. Once the berries are done simmering, very carefully pour or ladle them into the sling. (It’s good to have someone helping you at this point.) Leave them to drip for one to twelve hours. Once the juice has dripped through, throw out the cheesecloth sling with its dried-up berries. Measure the juice as you return it to the pot. Look at your pectin instructions and stir in the amount of pectin you need for the amount of juice you have. (For example, we had 16 cups of juice and used 4 packages of pectin.) Bring the juice to a boil. Pour into sterilized jars and can.